Can robots solve Grandma's loneliness? The elderly, a group notoriously indifferent to new technology, now finds itself as a target market for the growing robotics industry. Tech companies, auto manufacturers and startups are among those examining how robots can assist the elderly in their homes. Senior citizens, who often live alone, are at risk of being isolated and lonely. Intuition Robotics, an Israel-based startup that makes robots, announced Tuesday it raised $14 million from investors, including Toyota Research Institute, which invests in autonomous vehicles and home robots. 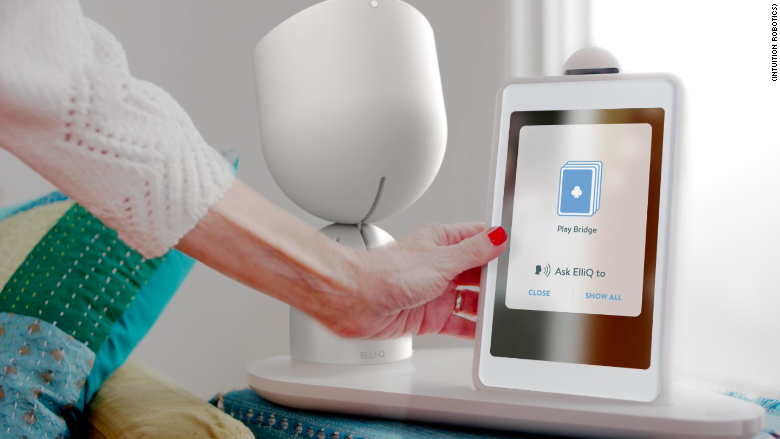 The funding will go toward developing a social companion robot, ElliQ. Toyota and IBM are two of the biggest tech companies researching how technology can aid older generations. ElliQ sits on a table and is designed to facilitate communication with family and provide reminders. ElliQ simplifies the sending of text messages and photos. The concept stems from Intuition Robotics CEO Dor Skuler who noticed his daughters were more comfortable sending selfies to their grandmother, rather than talking on the phone. "We communicate with our family all the time [these days] and then call grandma once in awhile," Skuler said. "But with ElliQ, it's easier to have more interactions with grandma." The robot is also designed to reduce caregiver stress. It can give reminders about upcoming doctor's appointments. ElliQ works to keep older adults engaged and active. It will make personalized suggestions such as going for walks, or listening to music. But companies developing these robots have to win over the elderly. Four in 10 senior citizens don't even go online, according to a 2014 study from the Pew Research Center. A robot in the home will be a leap for many. Skuler envisions a senior citizen's child purchasing and setting up the robot. His startup has done research to understand a form factor with which older demographics are comfortable. Skuler initially considered a robot that would follow the senior around their home but concluded the concept was too strange. Skuler expects the home assistant robots of tomorrow will specialize in a specific task and won't necessarily look like humans. "Our fridge doesn't look like a human. Our dishwasher doesn't look like a humanoid," Skuler said. Other robotics companies have taken different approaches to winning over senior citizens. Blue Frog Robotics makes the companion robot Buddy, which has wheels to navigate around a home. It will go on sale later this year. 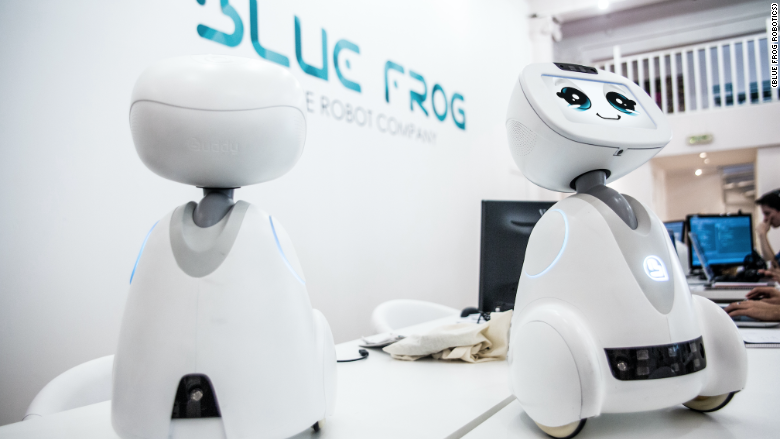 Blue Frog Robotics concluded the best way to have the elderly accept a robot was to make their product resemble robots from pop culture hits such as Star Wars and Pixar's Wall-E. Buddy features a large screen, which generally shows a smiling face. It offers access to Skype and FaceTime, detects falls and provides medication reminders. Then there's Hasbro, which now makes robotic pets for the elderly. A few years ago, the company's research team noticed unusual reviews for its line of FurReal pets, designed for ages 4 - 8. Customers started buying these toy pets for aging loved ones and leaving positive reviews. "We started to dig into the issues causing the reviews," said Ted Fischer, vice president of new business. "It's the desire for interactive companionship." Fischer was tasked to bring Hasbro toys to a nontraditional market. 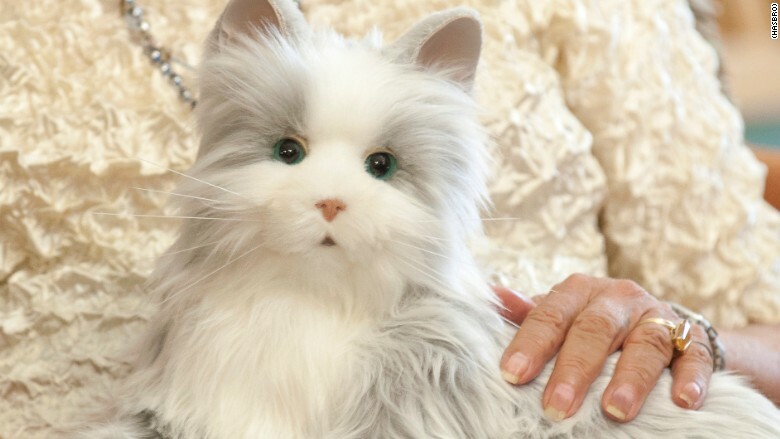 The company launched a robotic cat in 2015 and a robotic golden retriever the following year. Prices range from about $95 to $120. It has not shared sales figures. The Joy for All Companion Pets are designed to be realistic, reacting to human touch. The cat purrs and the dog barks. These robotic pets require little upkeep, and there's no fear a senior citizen will have to give up their companion if they move into a community that bans pets. Hasbro opted not to make the pets an Internet connected device, or one with a screen. This was inspired in part by Fischer spending time with a 95-year-old relative who doesn't listen to her voice messages, even if it's as simple as hitting a large button on an answering machine placed next to her. IBM is another company that understands not everyone is ready for a robot inside the home. It previously developed one that could measure a person's vital signs from camera footage. Meanwhile, one of its current projects creates smart home environments in senior living facilities. The researchers track a variety of factors, including walking and sleeping habits of seniors. The hope is that by better understanding a senior citizen's environment, the rate at which they're readmitted to a hospital will drop. Robotics is one of the hottest areas of the tech world, but winning over senior citizens won't be easy.